A theme of “myths & legends” inspired me to create a wassail bowl for a Somerset Guild of Craftsmen exhibition in Somerton last year. 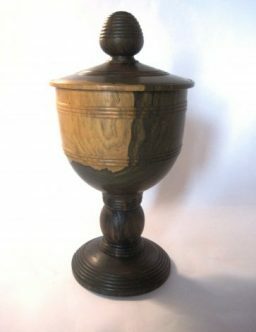 “The name, a Wassail bowl, derives from the Tudor custom of passing round a communal cup at Christmas time to the cries of ‘Waes Hael’ which means “be whole” or “good health”. Since wassail was generally brewed for Christmas and the New Year it was usual for the concoction to be served in the form of a sweet and highly spiced punch. Somerset has a strong and ancient tradition of “wassailing” the cider orchards on the 17th January which is the old Twelfth Night. As far as I can work out people gather, drink cider, hang toast dipped in cider on apple tree branches and sprinkle it on the ground under the trees. They then bless the apple trees and pray for a good harvest. 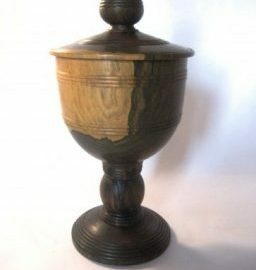 In an article by Stuart King, an internationally renowned woodturner, he mentions that a wassail bowl was traditionally turned from Lignum Vitae a newly discovered timber from South America. Now it just so happened that I had been given a round of Lignum from a woodturning friend who was emigrating to Spain and his wife had decided that this wood was too heavy to pack. Lignum Vitae, sometimes called ironwood, is one of the hardest and heaviest woods. It sinks in water and is 3 times harder than oak. Because of its durability and natural lubricants it is the preferred wood for propeller bushings and other underwater applications. It turns and takes detail well but you need very sharp tools and sometimes a scrapping action can achieve a better finish than cutting with a gouge. Abrasive paper clogs quickly with the natural lubricants in the wood so if you can get a finish strain off the tool- so much the better.